I'm not a fan of buttercream frosting that comes in a can. It just tastes so processed, fake and full of sugar. Instead of buying those, I'll usually whip up my own because it's so easy and tastes so much better. I don't like sugary frostings so my version has just enough to compliment the butter. 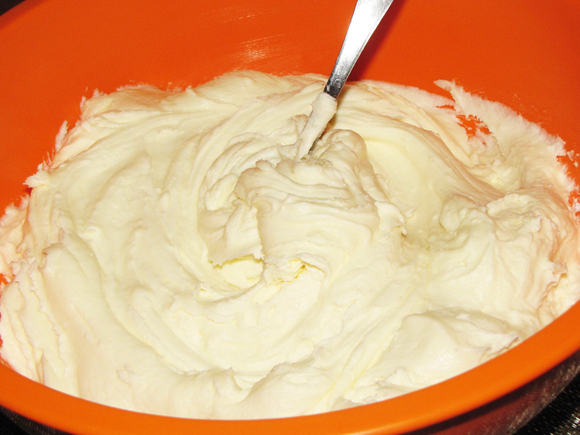 This recipe is an adaptation of my normal buttercream because I've incorporated almond extract. It adds a sweetness without additional sugar and enhances the flavors of the cake itself. 1. Beat butter until all softened together. 2. Add 1 c powerded sugar at a time, beating well after each cup. 3. When all sugar has been incorporated, add vanilla and almond extracts. 4. Beat all together until fluffy.